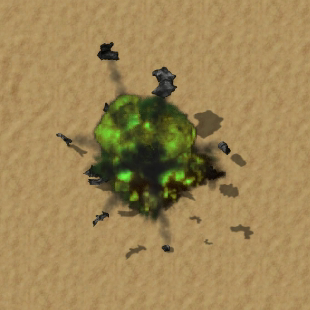 The explosive uranium cannon shells are an advanced ammunition type for the tank along with uranium cannon shells. Once they are made available, they surpass their regular variant; their damage and piercing power is increased, leaning more towards physical damage improvement. Since regular shells are still specifically required to manufacture uranium variants, any previously manufactured stockpile can be "upgraded" without waste. The piercing power of the shells has little practical use in spite of its improvement, which can be made insignificant since the enemy may often "outgrow" it by the time this ammunition is obtained. Its raw damage advantage otherwise found in the non-uranium explosive shell is also no longer as substantial; because of the kinetic energy nature of uranium-based ammunition, uranium cannon shells receive a much greater improvement overall, "catching up" in terms of raw damage potential, making explosive shell use on explosive-resistant enemies like worms, nests and especially spitters even more discouraging. However, this imbalance can be limited through research, and its area-of-effect damage has undeniable benefits. This page was last edited on 25 August 2018, at 11:49.